Ok, so I am a HUGE Purex fan. This laundry detergent works great on all of my family's clothing and is super affordable too. My local grocery store often has buy one get one free deals on Purex and so I always make sure I stock up. Purex Crystals Aromatherapy is more than just a scent – it’s a way of life. So take a step forward, change things up, and meet the new you. Enter now for a chance to win 12 bottles of Purex Crystals Aromatherapy. 200 winners! *Well Being. Aromatic citrus and floral scents add bliss to your day. *Energy. Citrus blended with essential oils will uplift your spirits. *Serenity. Watery floral scents and essential oils bathes you in tranquility. 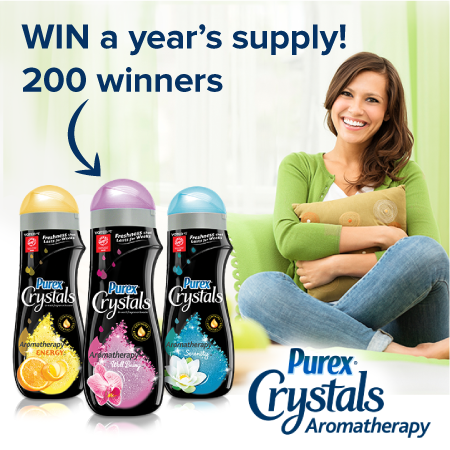 Enter daily for your chance to win the Purex Crystals Aromatherapy Giveaway Sweepstakes! Ends November 30, 2015. Good Luck! (200): 200 Grand prize winners will receive 12 bottles of Purex Crystals Aromatherapy. Approximate Retail Value (ARV): $14,400.